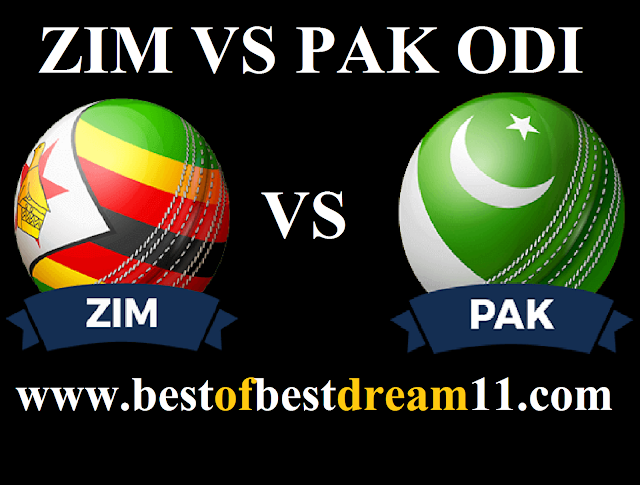 Welcome to our "BEST OF BEST DREAM 11 " for "ZIMBABWE VS PAKISTAN " THIRD ODI match . Here is best "ZIM VS PAK" ,Third ODI ,match dream 11 team for the Fantasy user ,who venue are looking to make a strong team for maximum win. We are providing latest news, match update, information about the match .The team is picked by using various factors on the basis of performance, ground stats and latest form. "In the five-match one day series Pakistan has made a 2-0 lead.In the previous match Pakistan won a 9-wicket win over Zimbabwe.By winning the third match, Pakistan will try to win the series." 1- Pakistan opener Imam Ul Haq and Fakhar Zaman are in excellent form in this series.Both of them had a glorious dominance of 119 runs in the previous match. 2-In the last match, Usman Khan took four wickets(36-4) in Zimbabwe,bowling superbly. 3- The entire batting lineup of Zimbabwe wll depend on H Masakadza,T Musakanda and Peter Moor. 1- Zimbabwe 's team,undergoing poor performance,can make some big changes. T Chisoro and E Chigumbura were seated in the last match, they could be fed in this match.